Are you looking for a squirrel poison, also known as a rodenticide? Well sit down and kick your shoes off, you've come to the right place. Of all the poisons we looked at for squirrels, our top pick goes to Contrac. Partly because of personal experience we've had with it in the field. But also because it has an industry proven track record of success, It only requires a single feeding to deliver a lethal dose (more about that shortly). It can be used inside and outside, where it withstands the weather for up to 60-days at a time. For reference, the active ingredient is bromadiolone at 0.005% with a number of inert ingredients designed to improve the taste and scent. At the end of the day, it just works! ​What does single feed and multiple feed mean for poisons? Will poison actually kill squirrels? Are squirrel poisons safe around pets and children? Impatient to get moving or just want a quick answer? Check out our summary list below, or keep reading for a more in-depth review of squirrel poisons. Squirrel poisons (rodenticide) are chemicals that kill rodents. Most rodenticides these days are anticoagulants, more commonly known as blood thinners. They don't actually thin the blood incidentally, that's just a common usage. It's like the terms sunrise and sunset. We all know the sun doesn't really rise or set, it only appears to as a result of the earth's rotation. The term blood thinner is used the same way. Below is a quick video going into what poisons actually are. An anticoagulant is any compound that doesn't allow blood to clot or interferes with the clotting process, known as hemostasis. Some of the earliest rodenticides were actually taken from medicines intended to be used on people. Today's rodenticides usually have one of four active ingredients in them. Let's break down each ingredient a bit further. What Is The Warfarin Poison? Warfarin was one of the first anticoagulants used to control rodents, along with pindone, diphacinone, and clorophacinone. They were all introduced in the early 1940's. Known as first generation anticoagulants, they were heavily used until researchers in Scotland began noticing the rise of warfarin resistant rats. Warfarin resistance led to the rise of second generation anticoagulants, which is why so many modern rodenticides will state on the label that they are formulated to kill warfarin resistant rats. Warfarin isn't used in rodenticides anymore but is still in limited use a medical treatment for people. It's one in a class of medicines known as thromboytics (clot busters). It's used for treating strokes, myocardial infarctions, pulmonary embolisms, disseminated intravascular coagulation (DIC) and deep vein thrombosis (DVT). All of these are potentially life-threatening conditions. Bromadiolone is an anticoagulant used primarily in rodenticides to kill rats, mice, and other rodents (such as squirrels). It was first registered for use in America in 1980 and is an odorless powder, usually white to yellow in color. It works by preventing the body from recycling vitamin K, which is needed to clot the blood. Once the animals run out of vitamin K they will take several days to bleed to death, usually internally. The antidote for bromadiolone poisoning is large does of vitamin K1, administered intramuscularly via injection by a physician, or orally. It's one of a group of rodenticides known as second generation rodenticides. Brodifacoum is an anticoagulant used in rodenticides that were first introduced in 1978. It inhibits the body from being able to recycle vitamin K. When the rats or squirrels run out of vitamin K, they die within a few days from internal blood loss. As with any vitamin K inhibitor, the antidote, tested in dogs, is massive injections of vitamin K1, or large quantities taken orally. 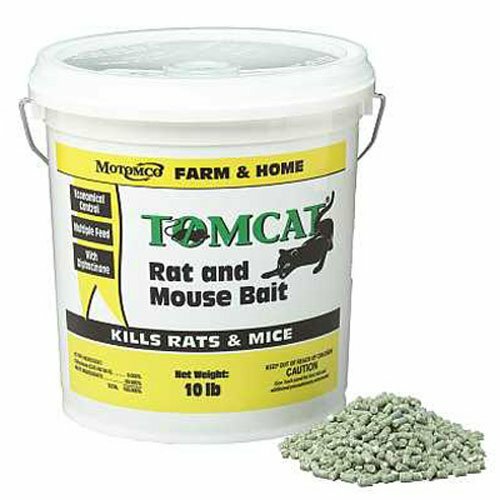 This is a second generation rodenticide. Diphacinone is also an anticoagulant that is a vitamin K antagonist. Invented by Bell Labs in 1990, it's another second generation rodenticide that prevents the body from recycling vitamin K, thus interfering with the blood clotting process. Again, vitamin K1 is the only antidote, but diphacinone is generally considered weaker than the others because it is a “multiple feeding” rodenticide. Simply put, this refers to the number of times a squirrel or other rodent has to feed on the bait for it to take effect. The single feeding baits are, in pest control jargon, “hot” because they'll kill the critters with only one or two bites of the stuff. It might take a few days for them to die, but once they bite into it, it's all over but the shouting. Multiple feed, or multi-feed, means it takes more than one feeding for the animal to die from the effects. Bromadiolone and brodifacoum are examples of single feed anticoagulants, while diphacinone is an example of a multi-feed anticoagulant. This requirement for multiple feedings is what keeps diphacinone-based rodenticides out of the top spot. They still have their uses (which we'll cover) but not as the # 1 top pick. Read More: What's the best way to deter squirrels? Yes, but it mainly depends on what time of the year it is. Let's explain. Squirrels are herbivores for the most part. They normally eat seeds and similar foods, so whether or not they eat the bait depends on what's available in the area when you put out your bait. During the late spring to mid-fall, there's plenty for them to eat, so baits won't be nearly as attractive to them as they are to rats and mice. For this reason, we like to recommend single feed rodenticides during this part of the year. If a squirrel does take a bite of the bait, we don't want to have to depend on them coming back for a second helping before it kills them. Below is a video of a man attaching a poison block to a branch of a tree, check it out. During the time of year from late fall to early spring, there is very little for them to eat. Everything has either died off or hasn't sprouted enough for them to be satisfied. During this part of the year, a less expensive diphacinone-based rodenticide will be attractive enough for them to come back to it several times. This way you can kill the squirrels “on a budget” so to speak. Read More: What's the best trap to catch squirrels? Rodenticides are poisons! They are never safe around pets and children. Always use bait boxes for outside baiting, or mount the bait high off the ground out of reach. To recap briefly, there are 5 rodenticides we looked at. Our #1 pick went to Contrac, but you should definitely take a look at the others to see if they'll fit your budget or needs. 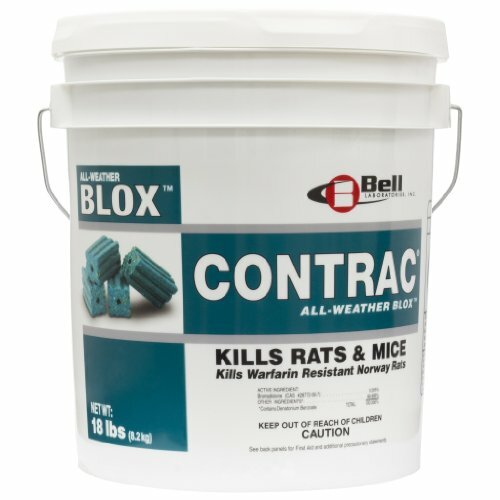 The Final Blox rodenticide is an especially good alternative. Rodenticides are poison, so please, always be careful where you put them. 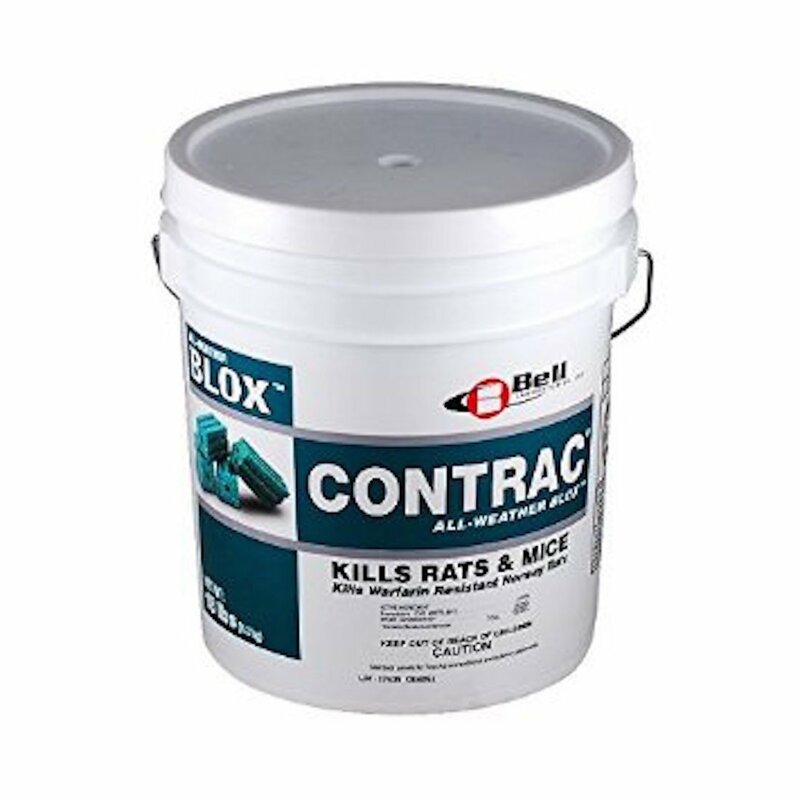 Contrac is one of our all time favorite rodenticides. It's been successfully used it many times over my for various pest control technicians. It has a proven track record of success inside and outside. The active ingredient is bromadiolone at 0.005%, so it's a single feeding rodenticide. It's our #1 top pick. The blocks have a hole through their length for use in bait stations where they need to be mounted on a rod to hold them in place. You can do the same thing in the trees where squirrels like to play. 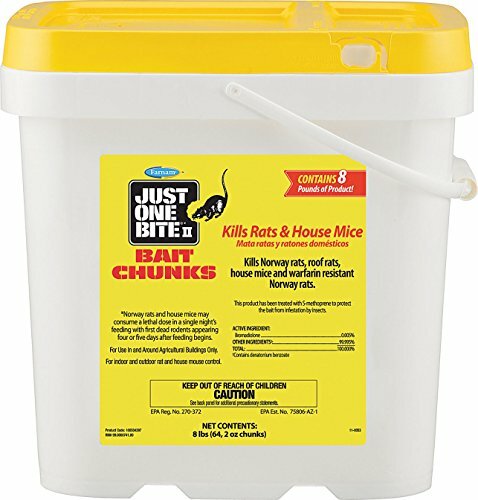 This bait also works well in rat bait boxes, which are large enough for squirrels to get in and out of. You should probably change the bait every 40-60 days if it's not eaten, more often during excessively hot or cold weather. It comes in an 18-lb bucket, so don't be shy about using plenty of it. But don't leave it out where pets and children can reach it! 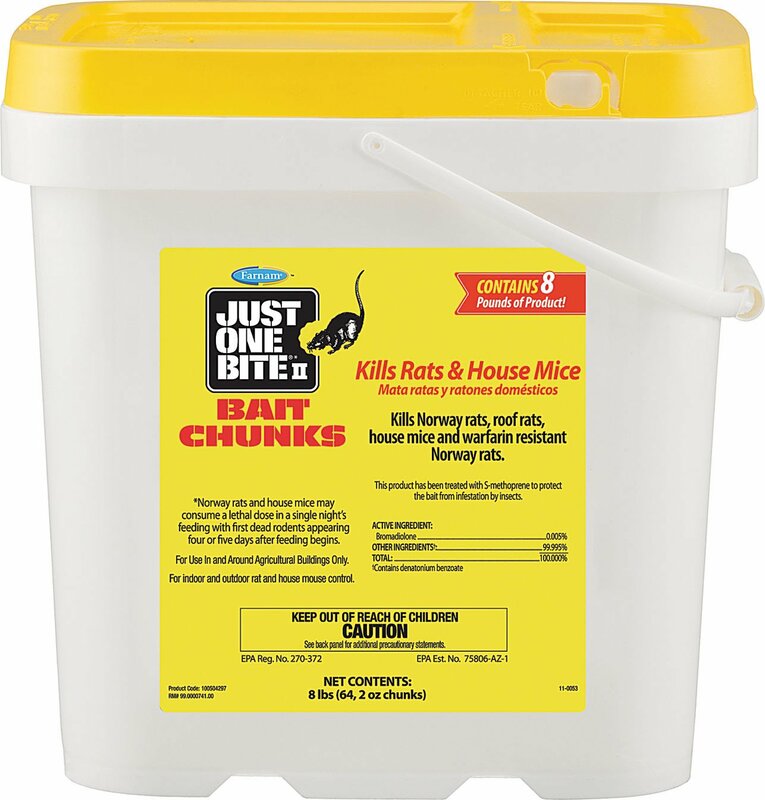 As always, read the label on any rodenticide before using it. In the pest control industry, we have a saying, “The label is the law.” This is literally true as the contents of the label are mandated by the EPA as well as various state agencies. Using it “off-label” is a criminal offense. 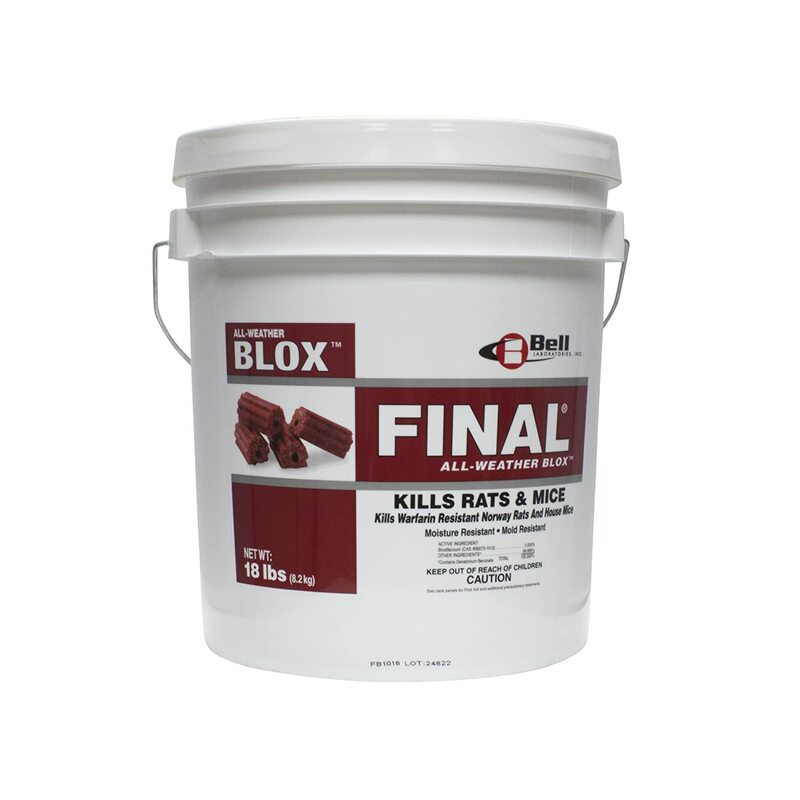 Final Blox is another of my favorite rodenticides. The active ingredient is brodifacoum at 0.005% so it's a single feeding rodenticide, with a good record inside and outside, in private residences or industrial settings. It works great either way. It also comes in an 18-lb bucket so use it with a free hand. This is our runner-up. It should be used in conjunction with bait boxes, or nails high up in trees. You can slide the manufactured hole in the block over the nail so the squirrels have access to it but your pets and children don't. Be sure to read the whole label before using it. Each state has different restrictions on how rodenticides are allowed to be used. You're responsible for knowing them and abiding by them. This bait has good resistance to the weather, so you only have to change it once every 40-60 days. If it's especially hot or cold, or unusually humid for several weeks in a row, you might have to change it more often. Farnam Just One Bite (for the bromadiolone active ingredient at 0.005%) is so named because it only requires one bite to take effect. This is the second version of the bait (that's the “II”), mainly just an upgrade in how it tastes. Like the first two on the list, it works well either inside or outside. However, it has a couple of restrictions on it. First, it's only available in 8-lb buckets. It's annoying to have to purchase multiple buckets to get the same amount of bait as you'd get in a larger container. Second, it's only labeled for use in and around agricultural buildings. If you use it in or around your house or business (other than a farm) you'll be using it “off-label”, setting yourself up for legal trouble if anyone catches you at it. What you do with it once you get it is your decision, you've been warned. It has good weather resistance and only needs to be changed once every 40-60 days, except during extreme weather. As always, be sure to use it with bait boxes and read the label before using it. These bait blocks come in a 9-lb bucket and use diphacinone t 0.005% as their active ingredient. This means it requires multiple feedings to take effect. The squirrels have to eat it, go away, then come back again for “seconds” to get a lethal dose. The peanut butter taste makes it very attractive to squirrels since they like all manner of seeds and nuts. 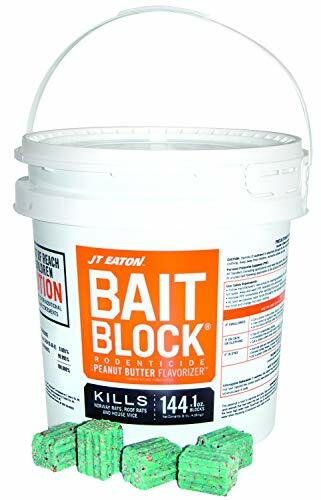 Like the other bait blocks on this list, they come with a hole through them for ease of mounting in bait boxes or on the sides of trees. For squirrels, this is a winter bait, useful mainly between late fall and early spring when their natural food sources are limited. With everything either dead or not having sprouted yet, squirrels will be much more likely to return to a tasty bait for several feedings. Always read the label and keep it out of reach of pets and children. This is another bait that uses diphacinone at 0.005% as the active ingredient, so it also requires multiple feedings for the squirrels to receive a lethal dose. It comes in 10-lb bucket and is relatively economical. Like the other baits, it has good weather resistance and can be left out for extended periods of time. It works inside and outside, and should only be used in bait boxes or high up in trees or shelves. It has a proven track record of success. For squirrels, you need to use this during the winter months, from late fall to early springtime for maximum effectiveness. With very little else to eat, squirrels are much more prone to repeat trips back to the bait. It's usefulness declines substantially during the warmer part of the year though. Make sure you read the label before using it, and always keep it out of reach of pets and children. There are plenty of squirrel poisons on the market. But years of personal experience, plus lots of industry testing, confirm what we knew from the beginning. Overall, our pick goes to Contrac. It has a proven track record of effectiveness, weather resistance, and attractiveness to rodents, including squirrels. A close – very close – second is Final Blox. We've enjoyed using it and the industry likes it too. With either one, you really can't go wrong.